Wisconsin hosts tens of thousands of miles of foot trails. Most of these miles are on unmarked and unmapped logging trails in the national forests Up North. Vast networks of ski trails, snowmobile trails, bike trails, footpaths, and abandoned roads combine into a labyrinth of potential walking routes. However, the majority of Wisconsin's hikers stick to established hiking routes in state parks and on the two national scenic trails crossing the state: The Ice Age National Trail and the North Country National Trail. Of these trails, the best offer scenic wonders, athletic challenge, uninterrupted length, and amenities for hikers such as parking, water, restrooms, and camping. Methodology: Absolutely no scientific method used here, no survey conducted. 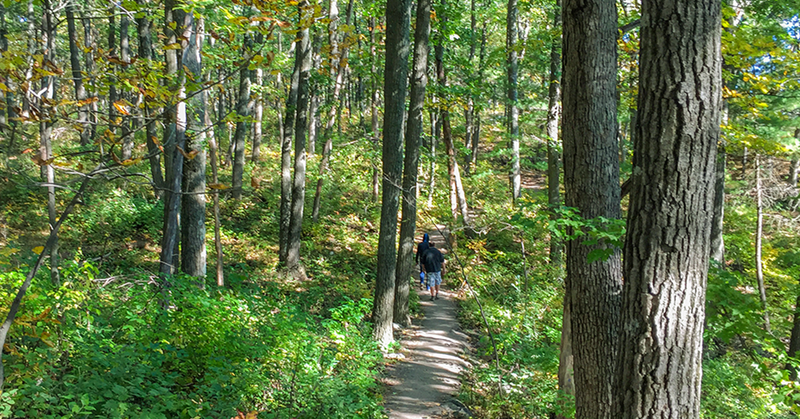 You'll find other great trails in WI, but hike these 10 trails and you will not be disappointed. 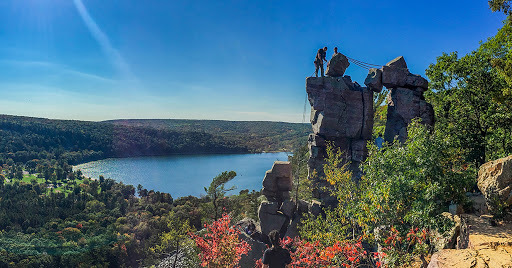 Devil's Lake is a mountain-like retreat in the Baraboo Range just south of Wisconsin Dells. 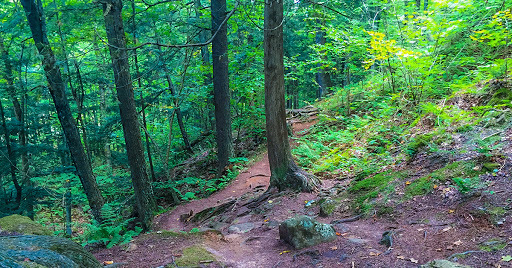 The Ice Age Trail here begins at a hidden canyon and waterfall at Parfrey's Glen, passes through the camping areas, and then courses through the heart of Wisconsin's most popular state park where it partially encircles Devil's Lake via the West and South Bluffs. Rocky vertical climbs include the most challenging mountaineering rated hikes that can be found in Wisconsin. The North Country National Trail crosses Wisconsin between Upper Michigan and Duluth MN. It enters the wilderness areas of the Chequamegon National Forest just southwest of Copper Falls. 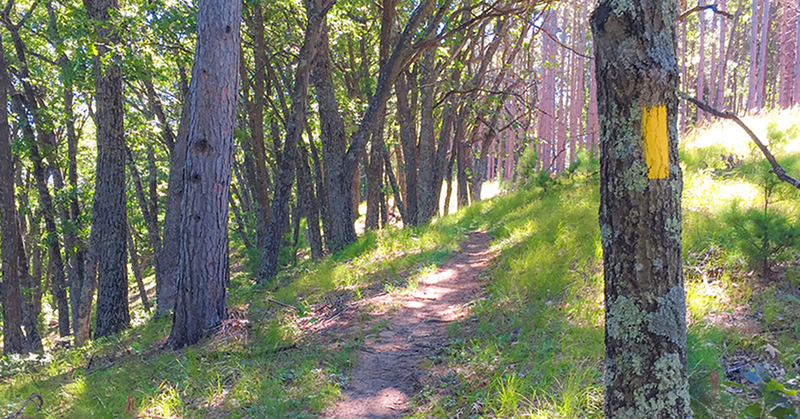 Even within Copper Falls State Park, the trail feels like hiking in the backcountry. Popular portions of this trail, which include the CCC constructed Doughboys Trail, encircle a confluence of powerful rivers where they cut a deep gorge into ancient rock. 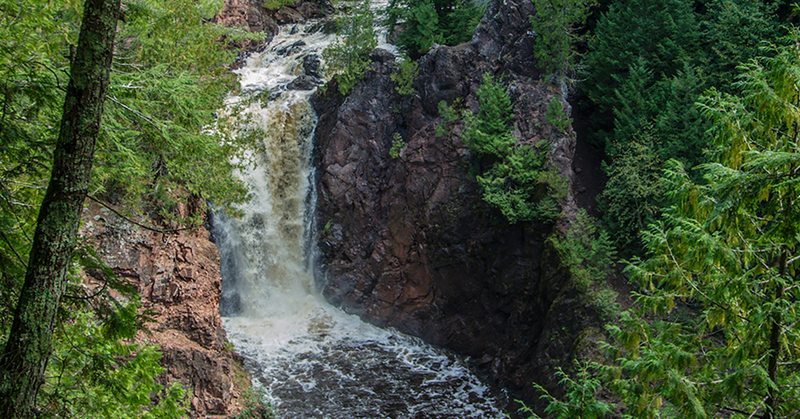 Hikers are treated to the dramatic scenes of the Bad River and the Tyler Forks of the Bad River as they splash down Copper Falls and Brownstone Falls. The spectacular scenery along this trail cannot be overstated. The Western Terminus of the Ice Age National Trail is a rocky ledge overlooking the St. Croix National Scenic River where hikers can survey scenery that begs to be painted in oils. 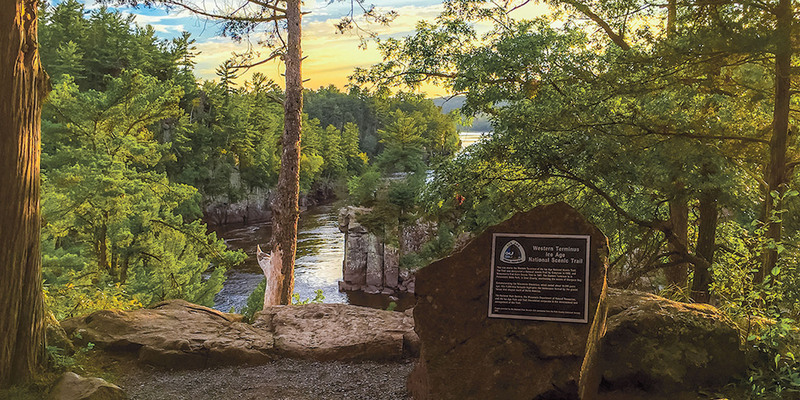 This promontory is the beginning of an 8 mile length of trail that meanders to the scenic hot spots in Interstate State Park before twisting through the wooded hills surrounding the City of St. Croix Falls. The tail end of this trail segment hugs the St. Croix River as the IAT presses north into Wisconsin wilderness. The sculpted rock shoreline of the Apostle Islands National Lakeshore is one of the top scenic wonders of Wisconsin. A section of the park can be accessed on the mainland at Meyers Beach which has been recognized many times over as America's top sea kayaking destination. Meyers Beach is also the trailhead for the Lakeshore Trail which cuts along the top of the bluffs. Some of the world famous Apostle Islands Sea Caves can be reached via this trail - but views are limited from the overland route. Nonetheless, this trail ranks at the top of Wisconsin's hiking experiences. The vegetation is dense and diverse and the terrain just challenging enough to keep your heart rate up. There are limitless options to reach secluded scenic vistas along the route which terminates at a backpacker's campsite. Hiking this trail is a total soul-enriching experience; take your time and enjoy it. The ultimate symbol of strength and majesty, the eagle has adorned the banners of every great empire and civilization from Rome to the United States. The Eagle Trail at Peninsula State Park is aptly named. Its trailheads survey Eagle Harbor and the maritime village of Ephraim in the distance. 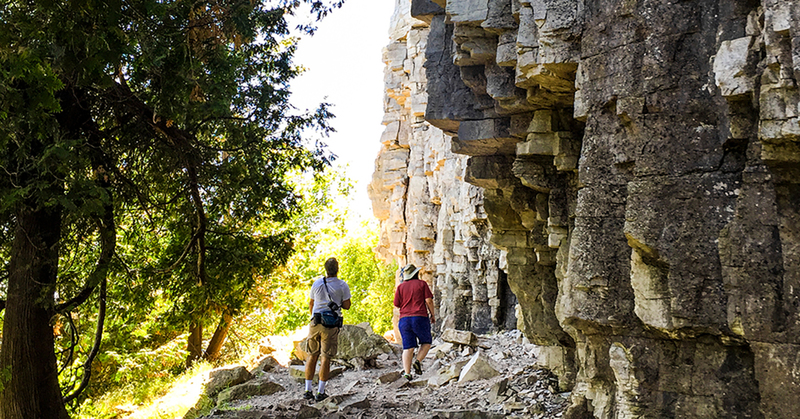 From these overlooks, the trail descends the imposing Niagara escarpment to the cedar-lined shores of Green Bay. This short loop trail is only complete on climbing a 75 foot high Eagle lookout tower. Kohler-Andrae is primarily a local beach destination but also protects Wisconsin's most surreal landscape. A cordwalk meanders through landforms created by the wind - a novel concept in itself. Immersion in this unusual terraforming disturbs your sense place and space. The hike feels like an exploration of an alien planet. Climbing the rock ledges at Eau Claire Dells is nothing short of pure joy. It's a natural playground that demands interaction and contemplation. Go to this park and just try not to climb down on the rocks to the water's edge, I dare you. I promise you that any fear of heights or sense of danger you have will melt at the excitement of this scene where heavy water splashes down and pours through a maze of iron infused rocks ... but do be careful not to be too enthusiastic as these rocks are slippery smooth. 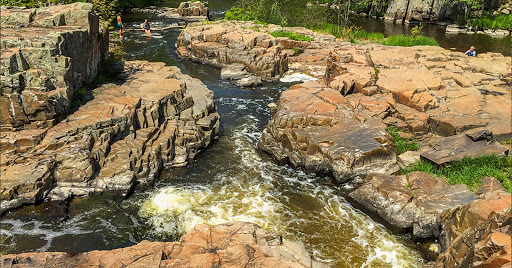 The Ice Age Trail adventures its way through the main hub of Eau Claire Dells County park and along the river into quieter areas where the trail closes into a single track passage through wilderness scenery. No list of Wisconsin's top trails is complete without due reverence for St. Peters Dome. This rustic trail in the Chequamegon National Forest is off the beaten path but worth the trip. An easy and wide footpath with bridges and boardwalks leads first to Morgan Falls - a unique waterfall that is a natural flume tumbling 70 ft. From there the trail increases in difficulty as it climbs rocky Appalachian-like terrain to a bald rock promontory incidentally named "Old Baldy". 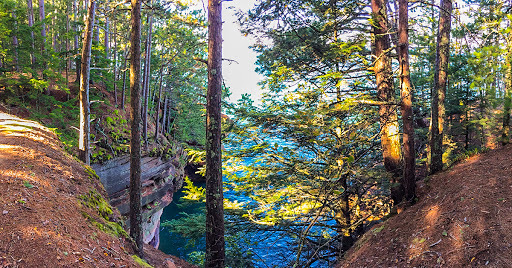 From the top of Old Baldy hikers can survey uninterrupted green forests below that stretch to the Lake Superior shoreline. 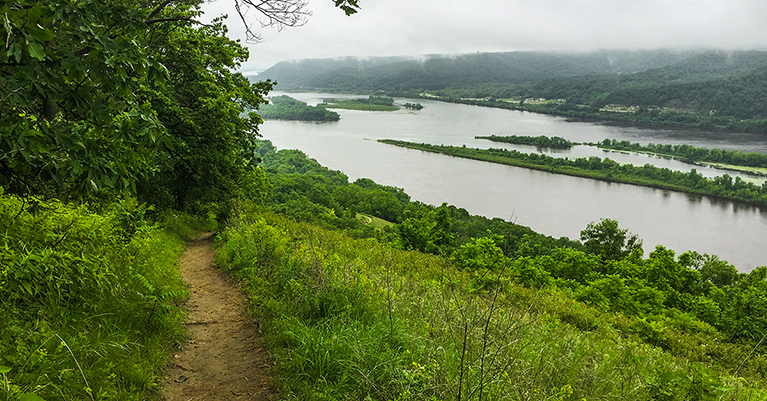 This double loop trail scales two mountaineering rated climbs to Perrot Ridge and Brady Bluff which overlook the confluence of the Trempealeau and Mississippi Rivers. These trails aren't rustic by any means, but deliver heart-thumping adventure for hikers who enjoy a sense of athletic accomplishment. There are many trails which could have taken the 10th spot in this top ten list. the Old Settlers Trial at Wildcat Mountain, The Billings Creek Trail in the Kickapoo Valley Reserve, the Sentinel Ridge Trail at Wyalusing or many others could all be top ten rated trails. But, I will leave you by naming this lesser-known segment of the Ice Age Trail which is hiking bliss. There is nothing challenging about the Mecan River Trail and no notable scenic vistas. 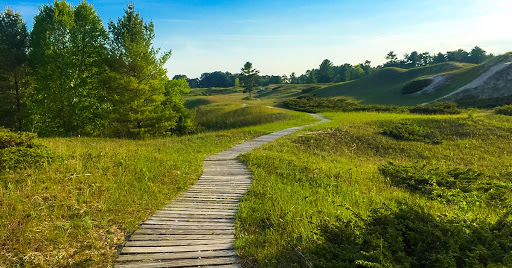 It is simply a rustic hiking route through wooded ravines and wide expanses of pristine prairie. Still, there is something enticing around each bend in the trail that keeps hikers wanting to continue racking up miles. If you're interested in shedding your cares and concerns on a full day 16 mile out-and-back in nature this is the perfect trail. There's just something about the air on this long easy going walk that breathes of new life and will leave you energized and satisfied.